Custom shapes and vents available. Seamless integration with BIPV modules for energy generation. Variety of glass options available for different transparencies. Factory finish on all materials before assembly for exceptional durability. Seamless integration of all other TRU systems for continuity. The narrow face widths of the aluminum skylight system provide transparency, create additional useable space and can be used with almost any building type thanks to their timeless design. Our TRU curtain wall application transforms in to a skylight when placed in a roof, canopy or awning setting. 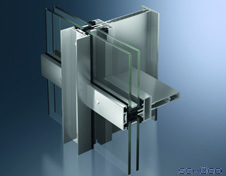 While providing exceptional strength and durability, they are economical to use in congruence with Curtain Wall systems because they are based on a single system platform. The systems are still extremely fleible with numerous design options. Unlimited design elements with add-ons. Oversized panels available for maximum glass. Integration of other TRU systems including venting windows and doors. Ability to integrate BIPV for energy generation.